After the Olympics and then relegation from the World Series, is the development of rugby in Brazil in trouble? On the contrary, Brazil Rugby Confederation CEO Agustin Danza tells us, it was all anticipated, and the long-term plan is still in place. Brazil has always been by far the strongest women's rugby nation in South America - where does this strength come from? I believe Brazil was the first country to move in the direction of women 7s, so we are enjoying the advantages of being a first-mover. However, we can already see some countries, like Argentina and Colombia, that are making great progress. Soon we will have a much more competitive region, which will be good for everyone. Can you tell us about your talent identification programmes? After the Olympics we included our Women 7s program into our High Performance System. The System has five academies spread out in Brazil, three of them have the mission to detect and develop talent and two of them are High Performance academies, aimed at training the best players. In each of the five regions the staff in charge of each academy has the mission to detect talent, by visiting all the clubs of his region and attending competitions. If a player is deemed to have potential, he/she is invited to train at the academies. Can you describe the effect the Olympics had on women's rugby in Brazil? How have player numbers and media coverage grown? Media coverage during the Olympics sky rocketed, as it was expected. This was very good to get rugby out there. A lot more people now know what Rugby is in Brazil, much thanks to the Olympic media coverage. Women´s rugby is growing fast in Brazil, with new teams popping up constantly and the level of teams increasing very fast. No doubts this was in part thanks to the Olympic coverage, but also due to the great performance of our team. How have things changed since the Olympics? For us the Olympics were just one more milestone in our plan, so nothing changed per se. Our plans aim at Tokyo 2020 for the Women, 2023 for Men XVs and 2024 for Men Sevens. Rio 2016 was a milestone in our plan. Because of this, we managed to secure all of our sponsors after Rio 2016, even in the middle of the crisis. Brazil were relegated from the World Series last month. What effect will this have on women's rugby in Brazil? What are your plans for next season to ensure you get back into the World Series? We knew that staying core would be very difficult, because we are in a phase of renewal in our team. Players are retiring and new young ones are making their first appearances. So we had a plan ready for this scenario. We will make the most of the time until December 2018 to implement a very wide talent detection and development player, to strengthen the pipeline, thinking of 2020 and 2024. On top of looking for players with potential, we are also looking for some specific characteristics that our team lacks, and we will make the most of this time to find them. We will be ready for Valentin Martinez 2017 and HK 2018. Brazil are the only South American team to play a 15s test match, back in 2008. Since then there has been no repeat - as at the time it was said that that Brazil would concentrate on just 7s. Is that still the policy? That is correct. From the Brazil Rugby Union´s perspective we will invest HP resources only on Women 7s. This is a strategic decision that aims to maximize the impact of every dollar we invest. We would like to do it all, but unfortunately that would be counter productive given our resources and the situation in Brazil. Having said this, we don´t discourage Women XVs and we follow its growth closely. This year we launched a scrum course that we did in multiple states of Brazil and we invited the women´s XVs teams to participate. The author of Brazilian rugby website http://www.portaldorugby.com.br/ told us last year about a 15s tournament orgainsed by the São Paulo Rugby Union (FPR). He said there was "A small clash between FPR and CBRu" over the event - especially regarding some aspects of "player safety" and that the players had "demanded the Brazilian Rugby Union to develop XVs clinics". Can you tell us more about this and whether whether the CBRu will support player interest in XVs rugby? As stated above, we observed very carefully that tournament and saw a very big risk of serious injury in the scrums, due to lack of training and specific knowledge of the scrum. This was documented in videos and photos. As a consequence of the risk detected, the Brazilian Rugby Union designed a scrum course, focused on beginners and safety, and forced the tournament to stop (therefore the small clash with the FPR)´until every team had gone through the course. The players at first reacted against this, as is natural, players always want to play. The good thing is that in a very short term after their initial reaction, the players recognized that the course was very important. How long will it be before Brazil play another test match? 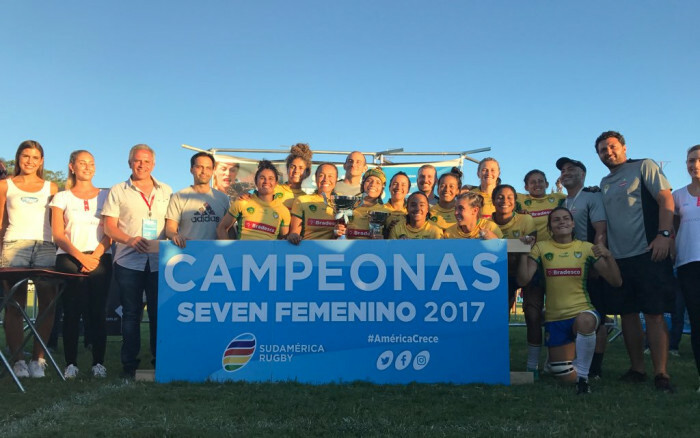 Women XVs are not a part of the High Performance programme of the Brazilian Rugby Union, so we don´t have any plans for a test match in the short/middle term.